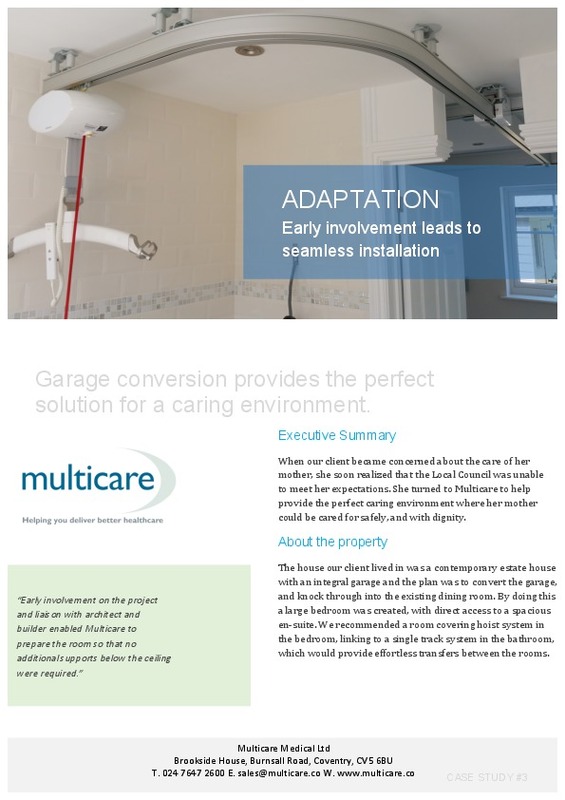 Garage conversion provides the perfect solution for a caring environment. When our client became concerned about the care of her mother, she soon realized that the Local Council was unable to meet her expectations. She turned to Multicare to help provide the perfect caring environment where her mother could be cared for safely, and with dignity. The house our client lived in was a contemporary estate house with an integral garage and the plan was to convert the garage, and knock through into the existing dining room. By doing this a large bedroom was created, with direct access to a spacious en-suite. We recommended a room covering hoist system in the bedroom, linking to a single track system in the bathroom, which would provide effortless transfers between the rooms. Being a domestic property, our client was clearly concerned about the visual impact of the hoist and track system, so we worked closely with the builder and architect to ensure that all above ceiling supports were in place prior to the ceiling being boarded. Additionally we gave the builder very accurate dimensions showing the hoist and track, to enable him to construct a aperture through which the hoist could travel in to the en-suite. Once the ceiling had been boarded, plastered and painted we were able to install the hoist brackets quickly and accurately. In the bedroom the room covering system means that the whole room is covered and our client’s mother can be transferred from the bed into her wheelchair with ease. She also has a day care chair, and the coverage means that there is no having to play ‘musical chairs’ with the chairs when transferring. The new combi lock gate system requires no power, making transfers from the bedroom to the bathroom very simple and quick, with no compromise on safety. The compact design of the GH1 hoist blends into the room, causing minimal impact.